Great sanding can yield some great results. Learn the proper techniques here as well as which grit of sandpaper to use to ensure that you get the very smoothest finish. Orbital sanders work by moving the sandpaper in a series of very small circles so that you can achieve a great finish every time, irrespective of the direction of the wood’s grain. 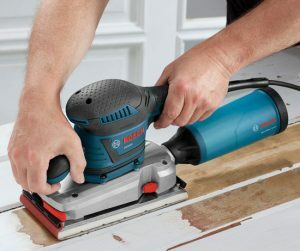 To clean the sandpaper on an orbital sander, run the handle of an old plastic toothbrush across the surface; heat generated by friction causes the plastic to melt and pick up debris adhering to the paper. Even the slightest scratch from sanding across the grain can be difficult to remove and the wood’s fibres will tend to be lifted more as well. Always sand with the grain. Coarse – 50 to 60 grit – for removing paint and sanding the roughest surfaces. Also useful when shaping. Medium – 80 to 100 grit – for sanding previously painted surfaces and for use at the intermediate stages of sanding, after rough sanding using 50 or 60 grit paper. Fine – 120 to 150 grit – for final sanding before applying a finish such as paint or varnish. Very fine – 160 to 240 grit – for smoothing primer or paint. Extra fine – 280 to 320 grit – for smoothing in between undercoats. When sanding a regular concave surface, a dowel stick of slightly lesser diameter is useful (remember to take into account the thickness of the sandpaper) To sand a complex or irregular concave surface use a pack of playing cards end on. By pressing your fingers on the top of the pack it will conform to the shape that you are sanding.